Wednesday night, the 14th of Kislev (November 28th, 2012) at the Hilton Hotel, was a night to remember. The inaugural Mayanot Points of Light Banquet Gala hosted over 600 guests, donors, supporters and alumni in celebration of sixteen years of Mayanot’s achievements. Guests at the event were greeted by Rabbi Shlomo Gestetner, Dean of Mayanot, and Rabbi Kasriel Shemtov, Executive Director. Gani Goodman opened the evening with greetings from an alumna. Rabbi Yona Metzger, Chief Rabbi of Israel, highlighted the unique educational role of Mayanot and Rabbi Moshe Kotlarsky brought greetings from World Lubavitch Headquarters. Steven C. Witkoff was featured as the Guest of Honor. In his response to receiving his award, Mr. Witkoff related: “It is human for people to lose their way, and the mission statement of Mayanot – as I understand it – is to be there for those young people”. Awardees also included Yitzchak and Tamar Tessler, who were introduced by their son, Mayanot alumnus, Foli Tessler. Mr. and Mrs. Tessler were honored as Pillars of Jewish Continuity. In Yitzchak Tessler’s words, Mayanot triumphs in “bringing young people back to their roots- bringing them back home”. 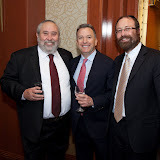 Many alumni attended the dinner and were excited to welcome their peer Adam B. Weinstein as Alumnus of the Year and their beloved teacher Rabbi Boruch Kaplan as Educator of the Year. The Mayanot dinner also celebrated the launch of the capital campaign for a new Mayanot Women’s Program campus. Yitzchak and Tamar Tessler pledged $250,000 for the new campus, Kevin Bermeister pledged $100,000 and David Schottenstein pledged $50,000. Their generous outpouring of support has invigorated Mayanot’s campaign to raise $4.5 million to expand their new campus. Coordinating the spectacular evening were Moshe Silver, administrator, Ruchie Stillman, event planner, as well as Bassie Fine, Shira Zagnoev, Mushka Gurevitch, and Batsheva Lieberman. Over the evening, Mayanot in all of its facets really shone and a true sense of success was felt by all those involved. Steven Witkoff, Mayanot’s Guest of Honor, is the founder of The Witkoff Group, a fully integrated, privately-held real estate investment firm, comprising both acquisition and management components. As the Witkoff Group’s chairman and principal shareholder, Steven emphasizes innovation, flexibility and teamwork as his methodology in always staying a step ahead of the market. For all of his noted achievements and successes in the business arena, however, Steven Witkoff’s greatest priority is to live a meaningful and purposeful life. Over the years, Steven has been involved in numerous charities and has championed many humanitarian causes. He is an ardent advocate on behalf of the State of Israel and feels very strongly about the obligation of American Jews to stand solidly behind her. Mr. Witkoff sees Judaism as a “point of light” – a positive and compelling force – that can bring people together in the pursuit of common human goodness and understanding. While relatively new to Mayanot, he recognizes that its students – who come to the program from all over the world and spend time studying the world’s oldest religion in the ancient land where it all began – are perhaps uniquely qualified to serve as agents in bringing this “point of light” back to their respective communities and to the world at large. Yitzchak Tessler is the CEO and President of Tessler Developments, a New York City real estate development company and is also the founder of a general contracting company called WBB Construction. Yitzchak and Tamar Tessler’s charitable and communal endeavors are numerous. Not least among the non-profit causes he has taken under his wings is the Mayanot Institute of Jewish Studies for which he has become a staunch, active and outspoken supporter. It was his initiative that led to the dedication of the Mayanot educational facility to the memory of Andrew Witkoff; it was his inspiration that led to the launching of this banquet campaign; and it is his bold action and leadership that is now blazing the trail for the next great Mayanot project: the construction of a new women’s educational facility. Rabbi Boruch Kaplan was born in Vancouver, Canada in 1956 into a loving and proudly Jewish family. After completing his Bachelors of Arts in Medieval History at UBC he came to Israel in 1976 to study in Yeshiva with Rabbi Chaim Brovender. Rabbi Kaplan began teaching in Mayanot at its inception and has cultivated and directed the growth of Mayanot’s renowned Talmud Studies Department. Students with little or no background are able to come to Mayanot and in a short time feel confident in their ability to understand a page of Talmud with commentaries. Rabbi Kaplan counsels them along the way, serving as role model and friend. His wisdom and life experience provide emotional support for the students, in addition to the scholastic concepts and Chassidic thought which he imparts. This inclusive attention, which serves as the basis of the educational experience at Mayanot, ensures that graduates are well grounded and pasionate Jews, playing a vibrant part of any Jewish community they join. Adam attended college at the State university of New York at Binghamton, in upstate New York. It was there that Adam met Rabbi Aaron Slonim at Chabad of Binghamton. In collaboration with Rabbi Slonim and after going on Birthright Israel, Adam resolved to spend a summer exploring his Jewish heritage in Jerusalem at Mayanot Institute. Adam’s learning experience at Mayanot not only established a platform on which to grow in Jewish observance, but also cultivated an atmosphere in which he made lifelong friends. Mayanot, he says “was a fantastic experience filled with great learning, great friends and great times.” It helped shape his level of Jewish involvement and communal activism. Today Adam lives with his wife Jodi in New York City, serves as Managing Director of New Mountain, sits on the Board of Directors of the Great Oaks Foundation, along with other charitable groups and professional organizations. Adam is actively spearheading an effort to create programs for the graduates of Mayanot’s Birthright Programs. His proudest accomplishment? Their 5 Month old son, Noah.